Rice and fish are traditional favourite foods, leading to a saying in Bengali, machhe bhate bangali, that translates as "fish and rice make a Bengali". 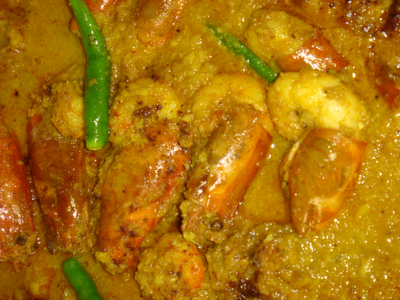 Bengal's vast repertoire of fish-based dishes includes hilsa preparations, a favorite among Bengalis. There are numerous ways of cooking fish depending on the texture, size, fat content and the bones. 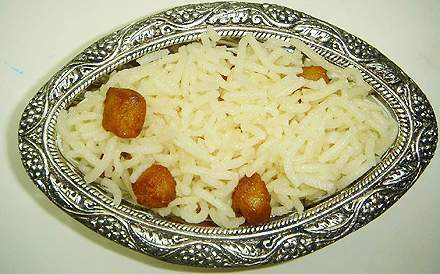 Sweets occupy an important place in the diet of Bengalis and at their social ceremonies. It is an ancient custom among both Hindu and Muslim Bengalis to distribute sweets during festivities. The confectionery industry has flourished because of its close association with social and religious ceremonies. Competition and changing tastes have helped to create many new sweets. Bengalis make distinctive sweetmeats from milk products, including Rôshogolla, Chômchôm, Kalojam and several kinds of sondesh. 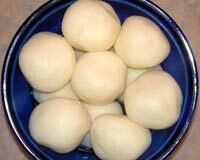 Pitha, a kind of sweet cake, bread or dimsum are specialties of winter season. Sweets like coconut-naru, til-naru, moa, payesh, etc. are prepared during the festival of Lakshmi puja. Popular street food includes Aloor Chop, Beguni, Kati roll, and phuchka. The variety of fruits and vegetables that Bengal has to offer is incredible. A host of gourds, roots and tubers, leafy greens, succulent stalks, lemons and limes, green and purple eggplants, red onions, plantain, broad beans, okra, banana tree stems and flowers, green jackfruit and red pumpkins are to be found in the markets or anaj bazaar as popularly called. Panta bhat (rice soaked overnight in water) with onion & green chili is a traditional dish consumed in rural areas. Common spices found in a Bengali kitchen are cumin, ajmoda (radhuni), bay leaf, mustard, ginger, green chillies, turmeric, etc. People of erstwhile East Bengal use a lot of ajmoda, coriander leaves, tamarind, coconut and mustard in their cooking; while those originally from West Bengal use a lot of sugar, garam masala and red chilli powder. Vegetarian dishes are mostly without onion and garlic.